As Yeovil get the best china out in preparation for Manchester United's arrival at Huish Park, and Dale Jennings fires up the interweb to check out how his Ricky Villaesque solo second from a third-person view, we are going to bid you good night. More football tomorrow where Liverpool travel to Bournemouth, just ten places further down the Football League pyramid, and Tottenham go toe-to-toe with Newcastle in the final Capital One Cup quarter-final. Join us for it all. Yeovil manger Gary Johnson speaking to BT Sport: "The best football institution in the world is coming to Yeovil and that is what we wanted. They will be very welcome. "We are delighted and Accrington are devastated. This was the game of a lifetime to bring Manchester United to Huish Park. This was the biggest game, now that one on 4 January is." Accrington Stanley: Thanks to all who travelled and all who have wished us luck. Not to be in the FA Cup. Play-off place to chase now. Sheffield United have caused the night's big League Cup upset, knocking out top-flight Southampton with a 1-0 win at Bramall Lane. Marc McNulty scored the only goal, while the Saints finished with 10 man after Florin Gardos was sent off. Chelsea went through pretty comfortably in the end, winning 3-1 at Derby, but there will be concern for manager Jose Mourinho after Didier Drogba and Kurt Zouma picked up injuries. Craig Bryson's goal gave Derby brief hope after Eden Hazard and Filipe Luis had put the Premier League leaders 2-0 up, but that was extinguished when centre-back Jake Buxton was red carded harshly - after he was judged to have committed a professional foul on Loic Remy. Andre Schurrle wrapped up Chelsea's win. So the third round line-up is complete without the need for extra time, never mind penalties. These are the games that we can ink in for the weekend beginning 2 January. A great chance for Nathan Cameron to send it to extra time at the death, but his header is smothered by Mark Tyler in the Luton goal and the Hatters are through to face Mansfield. A ding-donger of a game with chances aplenty, but Cambridge shade it courtesy of Sullay Kaikai's deflected shot. They face either Luton or Bury in the third round. Tranmere hold on to see off their League Two rivals. Rovers will play Premier League side Swansea next month. Oxford will play Cheltenham in the league on the same weekend. Barnsley's extra quality tells in the end as they advance in relative comfort to a third-round meeting with Championship high-flyers Middlesbrough. Dale Jennings! For the match ball! Nope. The Barnsley man is denied a hat-trick by a great save from Jon Worsnop. Jennings looks like some player, but he has a hefty build that might put off any possible buyers. Rochdale stick their name in the third-round draw - without Aldershot tagging along with them. The League One promotion-chasers will play Nottingham Forest at Spotland next month. Oh yes they do! Oh no they don't! Mansfield think they grab a dramatic late equaliser. But the linesman decides to play the role of pantomime villain by raising his offside flag. No goal. Four minutes to go. Yeovil fans are bouncing on the terraces, they know they are going to be hosting Manchester United. I wonder if Bayern Munich included a buy-back clause in the sale of Dale Jennings. The Barnsley full-back weaves in and out of three defenders like they are training cones before sliding another pinpoint finish away with his trusty left peg. Done and dusted. Matt Done completes his hat-trick and Rochdale will face Nottingham Forest in the third round. They have left it late, but Mansfield are beginning to bang on the door. Rakish Bingham's shot is deflected narrowly wide by Ryan Bird, and it is kitchen sink time for the hosts as the clock ticks down. Less than five minutes of normal time left. Yeovil all but book a dream third-round trip to Manchester United. Kieffer Moore heads in the second home goal as Huish Park breaks the ground's decibel meter. Chester are lobbing men forward and the decibel count is rising. John Rooney's corner is cleared though and I'm not sure that the home fans really believe that a late heist is on. Leroy Lita is being readied on the sidelines for Barnsley. Euphoria for Yeovil. Heartbreak for Accrington. Simon Gillett smashes in to the top corner to leave Glovers fans dreaming of Manchester United. Little over five to go. Have Aldershot been Done for? Looks that way. Matty Done skips around the away keeper to give Rochdale a two-goal cushion. They are edging closer to an attractive home tie against Nottingham Forest next month. It should be 1-0 to Accrington Stanley! Away forward Shay McCartan thumps a shot against the Yeovil woodwork and the ball drops to an unmarked Matt Crooks six yards out. Huish Park holds its breath. Crooks fluffs his lines. Somehow he heads wide. Cambridge look like they have this one covered. The U's have held Mansfield at arm's length like a sixth-form bully extracted pre-teens' dinner money, but with only one goal banked they could still get their comeuppance. A little under 15 minutes to go in all our games. And now Luton are hanging on at the other end. A clutch of Bury players are sniffing around the loose ball before Mark Cullen thumps long and clear. Angrily rev your engines and pip your customised horns on your souped-up high-performance cars! Max Power - named after the car magazine obviously - slides in from close range as Tranmere overtake their League Two rivals in the race to face Swansea of the Premier League in the third round. Luton will only have themselves to blame if they don't kill off this tie. Scott Griffiths' effort is only half-saved by Shwan Jalal and it takes a hurried hack off the line from Nathan Cameron to keep the deficit down to one. Well that didn't last long. 101 seconds after Aldershot equalised, Rochdale are back in front as Peter Vincenti hooks in a poacher's finish from six yards. What did we tell you?! Here's the Aldershot leveller. Dan Fitchett rises above the home defence to equalise for the League Two visitors. An upset is on the cards at Bramall Lane, where League One side Sheffield United lead Premier League opponents Southampton 1-0. Marc McNulty turned the ball over the line after keeper Fraser Forster fumbled a Bob Harris free-kick. Little prospect of a shock at Derby, though, where Premier League leaders Chelsea lead 2-0, with an effortless 25-yard bending free-kick from Filipe Luis - his first for the club - adding to Eden Hazard's first-half effort. Tell you what, Aldershot are not out of this. Rochdale have controlled possession and territory, but the Shots are showing defensive resilience that the lads at the huge Army barracks in the famous military town would be proud of. Great effort. So close for the Stags! Mansfield are almost level as Chris Clements finds Reggie Lambe and the midfielder's shot trundles agonisingly wide. A matter of millimetres. Lovely, lovely stuff from the visitors. Devante Cole steps over a pass, allowing the ball to run to Kane Hemmings, who fixes his defender before slipping the ball into the path of the on-bombing sound-a-like Dale Jennings. The full-back sets his shot outside the far post but with a suspicion of curl to bring it back inside just in time. That is the sort of form that earns you a move to a European giant. Oxford look like the team likeliest to win the snappily-titled 'Battle of the Bottom Half of League Two'. Joe Riley fires wide shortly before the hour mark, before a slick passing move ends in the on-loan Bolton midfielder narrowly missing the target again. Encouraging signs for the visitors. I think Chester may have been issued with a half-time rocket. The conference side have coming roaring out of the traps, but still it is League One Barnsley who look the more effective in the final third. It takes a tremendous full-stretch block from Matt Brown to deny Devante Cole as he turns in the box. Luton close to a second goal that may well have been lights out and goodnight for Bury. Andy Drury's weighted through ball runs for Shaun Whalley who dinks the ball over the goalkeeper and just inches wide of the far post. Mark Cullen is racing in to try and get a scoring touch, but he makes painful contact with the frame of the goal and none with the ball. Accrington haven't played Manchester United since the two north-west sides met in the 1946 FA Cup. When Sir Alex Ferguson was still tearing around the east end of Glasgow in short trousers. But Stanley go close to edging towards a rare encounter as big striker Andy Procter volleys over. Cambridge are still bossing things at the start of the second half. Kwesi Appiah wriggles through a hole in the Mansfield defence but goalkeeper Sascha Studer is off his line quickly to get a block in. League One strugglers Yeovil race out of the blocks in the second half - as they did after the first whistle. Home midfielder Simon Gillett fires just wide of the League Two team's goal, then Stephen Arthurworrey's volley flashes over the crossbar. An almighty goalmouth scramble with legs and limbs all over the shop and it is Luke Rooney who is claiming the decisive touch as the hosts edge ahead. Even this far out, it might be time for Luton to batten down the hatches and see this lead out. There is a bumper 3,534-strong crowd in the Swansway Chester Stadium and they have just seen the first yellow card of the night as Michael Kay chops through the visitors' Conor Hourihane. Forty-five minutes to earn an FA Cup tie against Manchester United. Forty-five minutes for Accrington substitute Josh Windass to make a name for himself. He comes on for Stanley at the break. We are back under way around the grounds. Chelsea are good value for their 1-0 half-time lead at Derby in their League Cup quarter-final, with Eden Hazard scoring in the 23rd minute. There were eight minutes of stoppage time at the end of the first half after a nasty-looking head injury to Chelsea centre-back Kurt Zouma, who appeared to be knocked out after being caught by his own keeper Petr Cech at a corner. Zouma was carried off on a stretcher. No goals in tonight's other quarter-final between Sheffield United and Southampton at half-time. Legendary reggae instrumental 'The Liquidator', by Harry J All-Stars of course, is pumping out of the Yeovil PA system. That means it is almost show-time again. BBC Sport's Alistair Durden: Big build-up, big crowd, but nervy stuff at Huish Park. That's only going to intensify if this stays nil-nil. The winners play Swansea in the third round - 45 minutes left for someone to be a hero. Rochdale are half way to clinching a third-round tie against Middlesbrough. Not a sliver of light between these two so far. Plenty of 'omph' in the tackles, plenty of sweat on the brows, but not a lot of creativity in the final third. It looks like we are heading for the third draw of the season between these two and possible penalties to decide who gets Mansfield or Cambridge in the next round. Get the League One big boys back to our place and do a number on them on home turf. The first part of Chester's plan went off swimmingly, but Barnsley have been doing a thoroughly professional job of thwarting the second half. Kane Hennings' walloped mishit into the roof of the net has them on course to face Middlesbrough. Sullay Kaikai's goal is what separates the two sides in a game full of chances. It probably won't be the matchwinner if the two attacks continue to carve out chances at this rate. The winners get either Luton or Bury in the next round. Tense, nervy and tight. Three adjectives you would probably expect from a match between a struggling League One side against a mid-table League Two side with a home tie against Manchester United at stake. All square. Tranmere equalise shortly before the break as Kayode Odejayi converts from close range. Chelsea's class is starting to tell in their League Cup quarter-final at Derby. Eden Hazard has given the Premier League leaders a 1-0 advantage with a classy low shot into the bottom corner after a mistake by Jake Buxton. Plenty of pressure from Jose Mourinho's men, and it's as much as Derby can do to stay in the game right now. Tonight's other quarter-final is more evenly matched, with Sadio Mane going close in a goalmouth scramble for Southampton at Sheffield United. It's 0-0 there. A top-drawer save from the man in the mask! Jon Worsnop flings himself across the Chester goal to get a hand to Conor Hourihane low curling effort and keep the Conference hosts just one goal adrift. Chester are on the ropes. Five minutes to the break and the sanctuary of the dressing room. Very nervy stuff at Huish Park - not surprising giving the prize at stake. That's Manchester United in the next round if you've not been paying attention. Somerset taking a battering by a heavy rain storm isn't helping the quality either. Mansfield are starting to build their way back into the game. Chris Clements' sliderule pass slices open Cambridge's defence and Ollie Palmer looks set to score, before a tremendous lunging challenge from Ian Miller sends the ball over the top. Highlights from tonight's matches at Deva Stadium and Huish Park are already appearing behind the highlights tab at the top of this page. Have a gander at Dale Hemmings' goal for Barnsley and you tell me if he got a little lucky... And there's an excellent near-own goal calamity n there too. A home goal has been in the pipeline - and here it is. Joseph Rafferty sends in a teasing cross and Matt Done makes no mistake by guiding the ball into the Aldershot net. Advantage to the League One side over their non-league visitors. Barnsley are taking some of the bounce out of Chester City's boisterous home support. The Tykes are making their League One quality show against Conference opposition, keeping hold of the ball and probing intelligently. Kingsley James is far too keen for the hosts as the ball bounces invitingly for him 20 yards out on the angle, shanking his shot towards the corner flag. Yep, that is a Barnsley throw-in. Classic commentator's curse. Sorry Tranmere fans. Although your team's defence is more to blame, we'd respectfully suggest. Danny Hylton swings in a cross from the right, the home defence switch off and Alfie Potter swoops in to nod in the opening goal. Oxford will host Swansea in round three as things stands. What is happening at Prenton Park, we hear Tranmere, Oxford and Swansea fans cry?! Little. Tranmere go on the attack but James Rowe shoots wide. It is all Cambridge United at Field Mill. The U's are looking dangerous with goalscorer Sulley Kaikai and strike partner Kwesi Appiah causing problems for fellow League Two side Mansfield. Accrington have fought their way back into this contest after that early scare (see 19:59), but both sides have yet to manage a shot on target. Yeovil's on-loan striker Tom Eaves - a Lancashire lad - blazes over a half-chance. Luton have pinned Bury back for a good five minutes. Luke Wilkinson heads over from the latest opportunity but Frasers Franks' effort against the post from Andy Drury's corner is as close as the Hatters have come. No goals in either of tonight's League Cup quarter-finals yet. Premier League leaders Chelsea are having plenty of the ball without really testing keeper Lee Grant at Championship side Derby. Sheffield United, of League One, have hit the bar with a Jamal Campbell-Ryce free-kick against a nervy-looking top-flight Southampton side at Bramall Lane. The Blades, FA Cup semi-finalists last season, may yet secure another last-four spot tonight. As if spurred on by our prompt about the prospect of playing Nottingham Forest, Aldershot race forward on the counter attack. Home defender Ashley Eastham is 'Johnny On The Spot' to hoof clear the danger. League One high-flyers Rochdale, as their loftier league position would suggest, are running the show in the opening 15 minutes. Dale's Peter Vincenti hooks over the woodwork as Conference side Aldershot survive. Remember, the winners play Nottingham Forest in the third round. Kane Hemmings celebrates like he always intended to blast into the top left corner as the ball broke to him in the box. But I think the Barnsley man will let out a sigh of relief. It was a bit of a slice that flew in, but could easily have flown over. Kane is the son of former Chester striker Tony Hemmings by the way. You can watch the goal via the highlights tab at the top of this page. Jon Worsnop in the Chester goal is wearing one of those Phantom of the Opera style masks to protect his broken cheekbone. He has not had too much work to do so far with Barnsley enjoying more of the ball but denied a clear sight of goal by the hosts' hard-working defence. Almost first blood to Yeovil! The home fans were dreaming of playing the men from Old Trafford for a split-second. Time almost stops at Huish Park as Accrington defender Tom Aldred watches his defensive header loop over his own open-mouthed goalkeeper's head. Luckily for the visitors, the ball agonisingly trickles wide of the Yeovil upright. Blushes spared. Oxford boss Michael Appleton says his depleted team - the ex-Blackpool and Blackburn manager has only named six substitutes on the bench - will not be afraid to attack their League Two rivals. The visitors hog the ball in the opening exchanges, creating a chance for Josh Ruffels to fire over. Sullay Kakai buys a ticket and comes up trumps. The Cambridge United man's 20-yard effort is drilled hard and low and a hefty deflection leaves Mansfield goalkeeper Sascha Studer hopelessly wrong-footed. No quarter given at Kenilworth Road where League Two sides Luton and Bury are both snapping into the early challenges. This one has the looks of a slug-out contest with the last team left standing to take up a spot in the third round. Cambridge United have made a bright start against Mansfield with Luke Chadwick forcing an early corner for his side. But Mansfield's Simon Heslop is fouled, allowing the Stags to boot downfield and clear the danger. a jazzy branded ball - officially 'mango' in colour, but distinctly pink from here. Should they save it for the first snow of the year? Yeovil force an early corner as the boisterous home crowd roar on their side. No dice from the set-piece though. One late change to the home side by the way - on-loan full-back Jordan Clarke was injured in the warm-up and Brendan Moloney fills in. When have you been one step from greatness? Eddie Nanton: I had a giant teddy bear in the claws of one of those grab machines, then dropped it with one arm hanging over the side. Breaking news....Keith Hill is reffing the tie between Chester and Barnsley. But not the Keith Hill. Not the ex-Barnsley boss Keith Hill who loves wearing a tweed jacket. That Keith Hill will be prowling the Spotland touchline as Rochdale boss, of course. There are a couple of famous names in the two forward lines at the Deva Stadium tonight. Leading the line for hosts Chester is John Rooney, brother of Manchester United striker Wayne, who is back in England after a spell playing in the United Stages for New York Red Bulls and Orlando City. Devante Cole, 19-year-old son of former Manchester United striker Andy, is in the Barnsley line-up. He has scored four goals for the Tykes since joining on loan from Manchester City. Yeovil and Accrington have only ever played each other once before - in the original tie just 10 days ago. Apologies for stating the blinding obvious. The pair loved that experience so much that they decided to go on a second date. But this isn't a romantic trip to the local cinema for Accrington fans. They face a 250-mile, four-hour trip (and that's providing someone's clapped-out Nova does not cause tailbacks on the M6) to see the apple of their eyes. Now that's what we call true love. Yeovil Town: Steer, Clarke, Arthurworrey, Nugent, Smith, Foley, Edwards, Ofori-Twumasi, Gillett, Eaves, Hayter. Subs: Moloney, Berrett, Leitch-Smith, Krysiak, Moore, Davis, Smith. Accrington Stanley: Rose, Winnard, Atkinson, Aldred, Liddle, McCartan, Joyce, Proctor, Mingoia, Carver, Crooks. Subs: Windass, Gray, Naismith, Simpson, Hunt, Molyneux, Barry. scrambled stoppage-time equaliser after a blooper-reel opener. As Bury manager David Flitcroft said, his team's first meeting with fellow League Two side Luton was a "typical FA Cup tie". The two sides also shared a 1-1 draw in the league in August. I hope that the groundsman has marked up the penalty spot clearly. Luton: Tyler; Harriman, Griffiths, Franks, Wilkinson; Doyle, Smith, Drury; Whalley, Rooney, Cullen. Subs: Lacey, Howells, Justham, Lafayette, Miller, Robinson, Stevenson. Bury: Jalal, McNulty, Tutte, Etuhu, Adams, Mayor, Lowe, O'Brien, Nardiello, Soares, Cameron. Subs: Jones, Hope, Rose, Hussey, Sedgwick, White, Lainton. We're asking if, like some of today's sides, you have been one final hurdle away from a great moment? Bara Menyn: I almost had ex England batsman Mike Gatting's autograph when I was 11 but he went to pad up instead of signing my book. Let us know via text on 81111 or on Twitter via #bbcfacup. Chester: Worsnop, Kay, Brown, Charnock, Roberts, James, Rooney, Heneghan, McConville, Mahon, Hobson. Subs: Winn, Roberts, Menagh, Harrison, Blake, Touray, Greenop. Barnsley: Turnbull, Holgate, Ramage, Cranie, Brown, Bailey, Berry, Hourihane, Cole, Hemmings, Jennings. Subs: Treacy, Davies, Digby, Abbott, Boakye-Yiadom, Cowgill, Lita. the teenager plucked from Tranmere's youth ranks by German giants Bayern Munich in 2011, is back at Barnsley after spending the early part of this season on loan at MK Dons. There are 47 places separating Barnsley (15th in League One) and Chester (14th in the Conference), but it hardly showed in a cagey goalless first leg in which Chester came close to a breakthrough. There was some old-school heroism from Chester goalkeeper Jon Worsnop who played almost the entire match with a cracked cheekbone, having also lost a tooth following an early first-half collision. Just about on the sensible side of Bert Trautmann. Think of a common link between Tranmere and Oxford? OK, they both play in League Two. That's too obvious. Think of another one? John Aldridge. You're right! The former Liverpool and Republic of Ireland is the most famous person to have played for clubs. After, er, someone else. Once. But the pair would each love Aldo in their team tonight as they target a third-round home tie against Premier League side Swansea. living out a Simpsons storyline. Tranmere: Fon Williams, Holmes, Donacien, Holness, Ihiekwe, Ridehalgh, Power, Jennings, Rowe, Stockton, Odejayi. Subs: Subs: Brezovan, Woodards, Laird, Madjo, Donnelly, Fenelon, Jahraldo-Martin. Oxford: Clarke, Riley, Mullins, Wright, Holmes-Dennis, Ruffels, Rose, Potter, Collins, O'Dowda, Hylton. Subs: Crocombe, Meades, Ashby, Humphreys, Howard, Whing. in the 2013 third round still rankles at Field Mill. The Stags looked like they were set for the third round again until Kwesi Appiah earned Cambridge United a replay with an injury-time strike earlier this month. The winner of this all-League Two tie will play the winner of Luton and Bury - also both League Two. Mansfield: Studer, Taylor, Sutton, Waterfall, Tafazolli, Beevers, Clements, Heslop, Bingham, Oliver, Palmer. Subs: Riley, Bell, Rhead, McGuire, Lambe, Fletcher, Bishop. Cambridge: Dunn, Tait, Miller, Coulson, Taylor, Chadwick, Hughes, Champion, Blair, Appiah, Kaikai. Subs: Norris, Atkinson, Nelson, Naylor, B Taylor, Simpson, Bird. Last year's competition was a tale of contrasting emotions for these sides. Rochdale were the giantkillers as they earned one of their greatest FA Cup results, while Aldershot were the, erm, giantkillees (?!) as they suffered their worst. by beating Championship side Leeds in the third round. Aldershot had to peel themselves off the floor after being knocked out of the FA Cup by Shortwood United of the Southern League Division One South & West in round two. a 0-0 draw in the original tie. Rochdale: Logan, Rafferty, Eastham, Lancashire, Rose, Bennett, Lund, Dawson, Vincenti, Done, Henderson. Subs: Lillis, Andrew, Noble-Lazarus, Hery, Cywka, Cannon, Camps. Aldershot: Smith, Gibbs, Oastler, Wilson, Barker, Hatton, Forbes, Molesley, Roberts, Holman, Williams. Subs: Fitchett, Thomas, Plummer, Diallo, Derry, Phillips, Oyeleke. Here's one for our older readers. Remember the days you used to frantically punch the number 302 into your TV remote control (when it had working batteries) to find team news on Ceefax's football page? Then you will love this. Yeovil announce their team for tonight's match in a Ceefax-style image on their Twitter account. Our goal flashes should be updating tonight slightly quicker. No need to keep pressing the refresh button, or waiting for page 2/2 to tick round. While the respective chairmen might be laying back with their mind on the money and the money on their mind, the players will not be focused on the cash. That's according to cricket legend David 'Bumble' Lloyd, who is also - as you may know - a non-executive director at Accrington. "If Accrington beat Yeovil, it could be worth as much as £250,000 to the club. But playing Manchester United would be about far more than money,"
he tells the Daily Mail. "My own association with the club goes back a long way. Unfortunately I was born a year after their only previous game against United - we drew 2-2 with them in the 1946 FA Cup, then lost the replay 5-1. We've had a few years to mull that one over…"
So, like some of today's sides, when have you been one final hurdle away from a greatness? Perhaps you were down to the final two for a job as an ice-cream taster, complete with a six-figure salary? Or served up a glorious summer barbeque, only to give your guests salmonella after getting complacent over the last pack of sausages? Or were you the unlucky third point in a love triangle involving the best-looking girl/boy in school? For those wanting news of Chester v Barnsley and Yeovil v Accrington, there is no need to rely either on these words or the commentary pearls from BBC local radio. We will have the goals from the Deva Stadium and Huish Park in glorious Technicolor at the top of this page shortly after the ball crosses the line. The highlights tab is the place to click to get some of that video goodness. 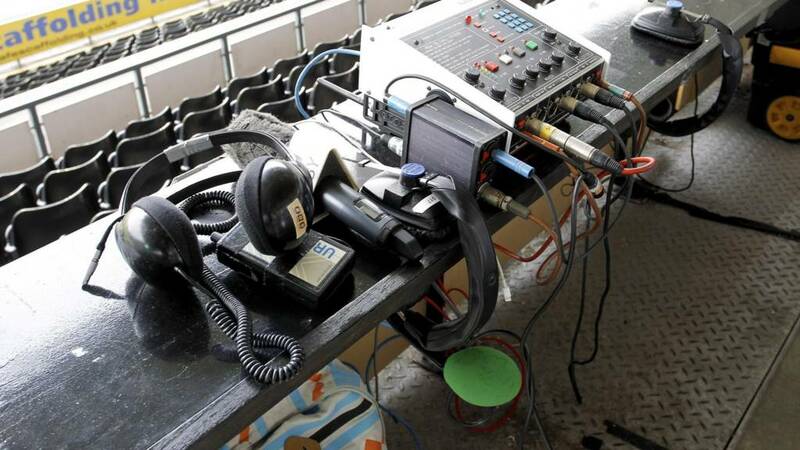 Whatever game you are after, BBC local radio has you covered FA Cup-wise this evening. with all the commentaries online, you have got a chance to see how your own local radio matches up to the opposition's regional service. Maybe that could be the tie-breaker in the event of a draw after extra time? Jingles instead of penalties. Then maybe we could beat the Germans. There is a mid-week online-only Final Score to help guide you through each of tonight's FA Cup goals. They will also lob you the odd bone from the League Cup quarter-finals -Derby v Chelsea and Sheffield United v Southampton - for desserts. That should have fired up at the top of this page right now. tapping the keys on a Capital One Cup live text if you just can't wait. All eyes are fixed on Huish Park - including the steely glare of Louis van Gaal - as League One strugglers Yeovil and mid-table League Two side Accrington meet. The Manchester United boss will be interested to see who his 11-time winners will face in the third round. Tranmere and Oxford, both scrabbling around at the bottom end of League Two, know Premier League opposition awaits too - in the shape of Swansea. Home ties against Championship teams are the prize for two lucky hopefuls tonight. Conference side Chester host Barnsley, of League One, for the right to meet Premier League-chasing Middlesbrough, while Aldershot - the lowest-ranked team playing tonight - travel to League One high-fliers Rochdale. And fans of the four other League Two teams in action will be keeping close tabs on each other's tie. That's because the winners between Luton and Bury face the winners of Mansfield and Cambridge. These are the sides doing the FA Cup hokey-cokey, with one foot in and one foot out of the FA Cup third round. For Yeovil and Accrington, that means that a prize home draw against Manchester United will be the reward for winning tonight. But there are other plum draws to focus minds. If the chance to test themselves against opposition from higher up the league tree doesn't get an extra 10% out of some players tonight, a few club chairmen might be making the point that winning is worth considerably more than 10% extra to the club coffers. 30 May 2015. Wembley Stadium. It is the big final date on the back of your FA Cup on Tour t-shirt. But before you get to the triumphant home-coming gig, or the bright lights of the third round, there are the sweaty, noisy backrooms of English football to negotiate. a centre-forward's snot rocket. Where the mud and muck nurture football's grassroots. Time for some second-round replay action.